Our employer closed business early on Friday so my colleagues and I happy danced our way out the door to the tune of Born Free into the three-day weekend. The weather was lovely as I entered the subway station determined to have a highly productive 72 hours focusing completely on household chores and writing. Just as I set foot on the subway platform I noticed that I received a text message from my buddy, Coco. 45 minutes later, my original plan is drowning in Sangria. On our way to Sangria-land, Coco and I walked from TriBeCa through SoHo. As we strolled west on Houston Street, we passed several street vendors selling their wares. We have sauntered past street vendors countless times without them ever registering on our radar, but on this occasion, one stand that was essentially full of junk caught all four of our eyeballs. 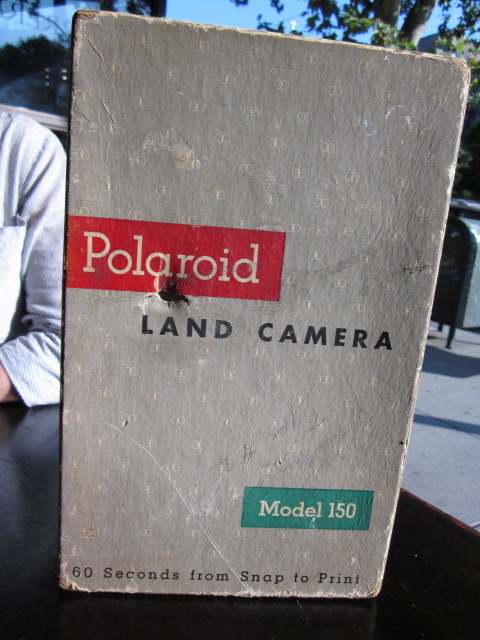 In lockstep we motored over to this table to further inspect a Mad Men-era Polaroid 150 Land camera. Coco: This is such a cool camera! The vendors, two women in their mid to late sixties, or maybe they were in their late forties and just looked to us as used as the goods they had on display, or possibly they were in their late seventies and they’re of French descent, and are actually aging far better than the rest of us … but I digress. However old they were they were oblivious to Coco and I drooling over this relic designed by Polaroid’s founding father, Edwin Land. It’s a camera and cameras are my kryptonite, and apparently, they’re Coco’s, too. You know someone for over six years and go figure, you continue to learn new things about them every day. Coco signals for one of the vendors to approach. Coco: I’m interested in this camera. The vendor takes it out of the box, and shows us how to open and close the bellows. She has no idea how old it is but insists that being in the original box enhances the value. 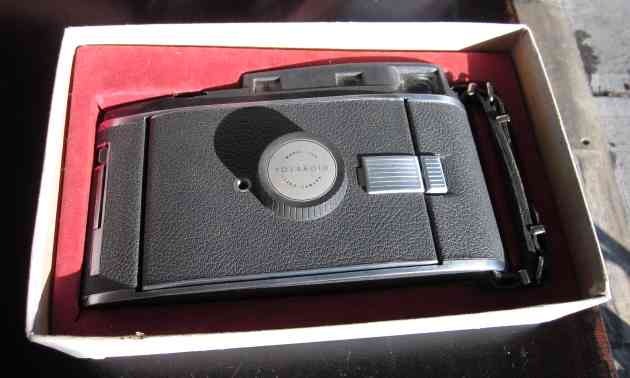 Folded Polaroid 150 in box. 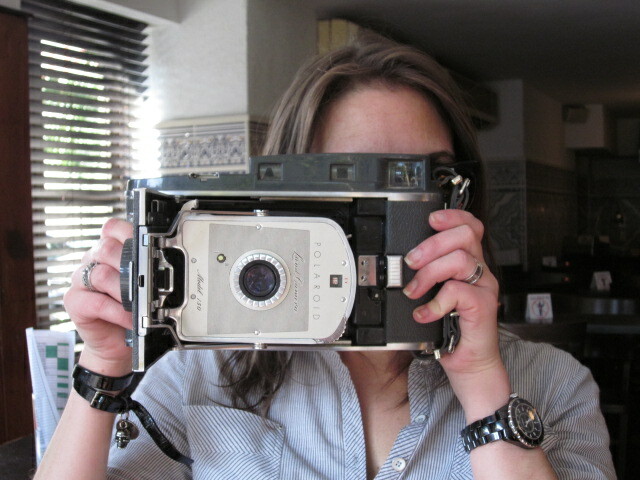 She’s pretty certain that this camera is still operational. Upon hearing that, I briefly escape my delirium. Me: But they discontinued making the film. Vendor (cornered): They discontinued making the film? Huh. Hm. Coco: How much is it? The vendor asks her partner the price and is told $50. Coco (boldly to vendor): I’ll take it! Afterward, we are sipping our Sangria and chowing on tapas with the camera on display on our table. Box with bullet hole, but Coco’s okay with that. She’ll claim that it originally belonged to a member of the mob. Me: You could have bargained with them! We had leverage! The film’s obsolete! Why didn’t I think to tell you this? Am I losing my edge? Coco is wiping my Sangria out of her eye. Coco: What’s wrong with you, what’s wrong with me? Am I so used to shopping at Barney’s I have no clue how to price haggle with old ladies selling junk on the street? Then Coco reasoned that even if she did overpay for it by $15, she’s okay with springing for drinks for those vendors. We later did some research on that camera. 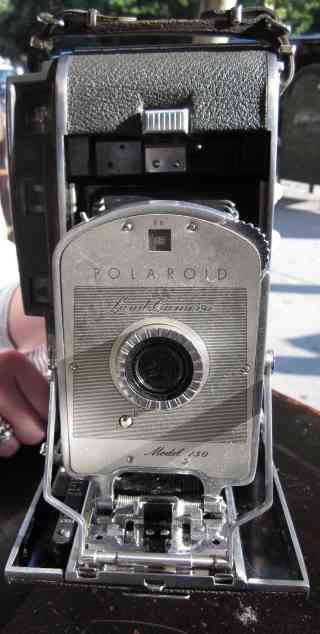 Approximately 400,000 Polaroid 150’s were manufactured between 1957 and 1960. In its heyday, it sold for $109.95, the equivalent of $873.14 in today’s dollars. Upon reflection, Coco got a pretty sweet deal on this novelty after all.